Kemeraltı marketplace was covered with vaults and rooftiles featuring a covered bazaar up until the end of 20th century. We know that some open-air alleys within Kemeraltı were once covered with cradle vault. Kemeraltı became a public center close to the harbour befinnig from the 17th century. The marketplace which was the heart of 18th century İzmir’s economy, consisted of many caravanserais and covered bazaars. Kemeraltı has been a spot where people are shopping and trading almost for 5000 years and that’s why it’s named “World’s oldest marketplace”. It today extends over an area of 270 hectares containing 14482 workplaces and more that 10 thousand craftsmen and tradesmen in more than 230 different sectors and branches offering more than 800 thousand different kinds of goods. 75 thousand people are employed in Kemeraltı and it is visited by 150 thousand to 750 thousand people daily. Being one of the most important connections between Eastern and Western markets along with Istanbul, Kemeraltı embodies the best part of İzmir’s historical and cultural heritage. Kemeraltı has several entrances on different sides. 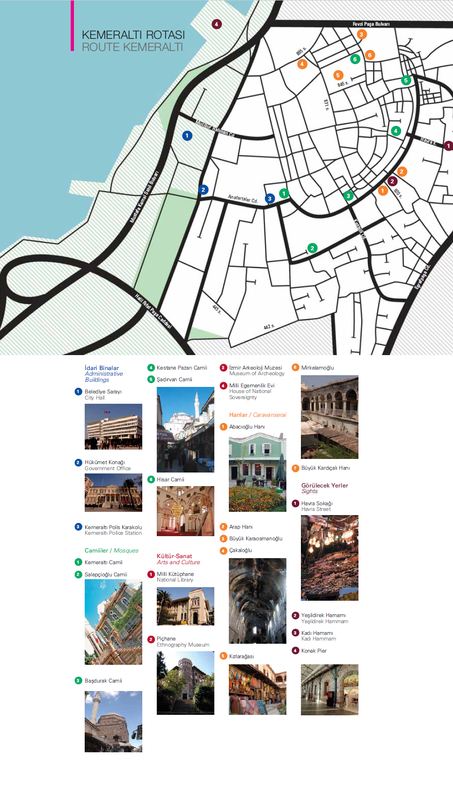 Our choice for this guide is the entrance from Konak Square. 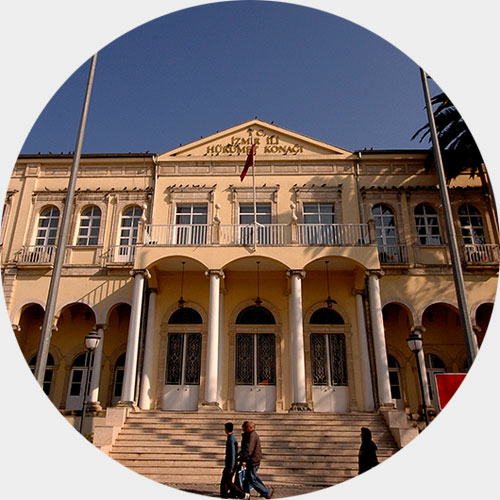 The Governor’s Office or Katipoglu Mansion with its old name… The centre of Izmir has always been Konak which takes its name after the mansion (Konak) of Izmir’s renowned Katipoglu family. The Family which can be traced back to the early 18th century, gained power in time and became one of the most influential forces in Izmir’s local politics. The small area in front of the general entrance became İzmir’s first Konak Square. The building became integrated with Yalı Mosque, formerly known as Ayşe Hatun Mosque that still stands in front of the building and Sulu Cemetary behind. When the Ottoman Sultan Mahmud II took steps to liquidate local lords and centralise the state, the mansion was nationalised in 1816 together with other properties of Katipoğlu family. The mansion, from then on, started functioning as the governor’s mansion and the service building of the governorship. However in 1863 it nearly collapsed after an earthquake and required renovation. In 1864 when Izmir was turned into the centre of Aydın, the renovation project was halted. In 1800’s İzmir had 4 libraries and 4 theatre halls, several concert halls, cinemas, schools and colleges all belonged to Christians and Jews. In 1911, Turks founded İlm'ü İrfan Cemiyeti (Society of Science and Culture) led by Kadızade İbrahim Refik, a Turkish lawyer, in order to build a National Library with a view to promote cultural institutions and develop Turkish national consciousness. 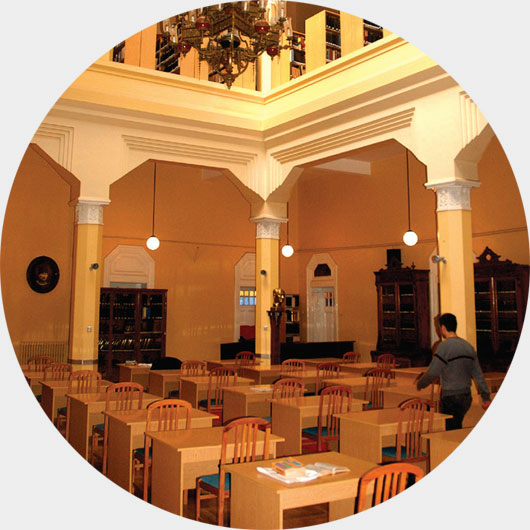 The committee consisting of 7-8 people formed within this Society was later became known as “İzmir National Library Society”. The society conducted several activities to raise funds and finally, the National Library opened with a few hundred books on July 23th, 1912, in the selamlique part of Salepçioğlu Mansion on Beyler Street. After the liberation of Izmir, the works resumed and The National Library building, opened with a great ceremony, on October 29, 1933 during the celebrations of 10th anniversary of the Republic. Today, İzmir National Library is home to 600 thousand books 5000 of which are handwritten including rare Koran codexes. Among the significant works in the library building are Katip Çelebi’s “Cihannüma,” a book on World geography and astronomy including 45 maps printed by Turkey’s first typographer İbrahim Mütefferika and A Greek work featuring the life of Aristotle, printed in 1531 in the Gutenberg Printing House. It was officially named The National Library in 1939 and has been serving under Izmir National Library Foundation since 1978. In the beginning of 19th century, the Greek, Jewish, Armenian and other non-Muslim communities of Izmir had their own hospitals, however there was not any health institution of the Muslim community. After the earthquake and the following epidemic in 1849, Emin Muhlis Paşa established the first daruşşifa (hospital) in Izmir. The area on which the hospital stands today was previously a British cemetery. The British Consulate, after moving the dead bodies to their homeland, donated the area to the Turkish community on the condition that a hospital is built. Emin Muhlis Paşa, with the permission of the Sultan, raised donations from the public and had the hospital built in 1851 and named ‘Izmir Gureba-I Muslimin’ (Muslim hospital for the poor). The hospital, built from stone and wood, had sections for men and women with 62 beds in total, and had initially a surgeon, a pharmacist, a director, a clerk and a janitor serving 6000 patients a year. The hospital’s budget consisted of several items including 44 liras 98 kuruş and 10 para from the Charity of the Sultan, 226 liras from the weighage of fruits and hay traded in the city, 350 liras from burial services for those who died in the hospital, 54 liras from the Ottoman Bank, 57 liras from the Regie Administration and 13 liras 80 kuruş from the revenues of Ali Paşa marketplace. In 1913, with the new General Law on Provincial Administration, the name of the hospital was changed as İzmir Memleket Hospital (Territorial Hospital). 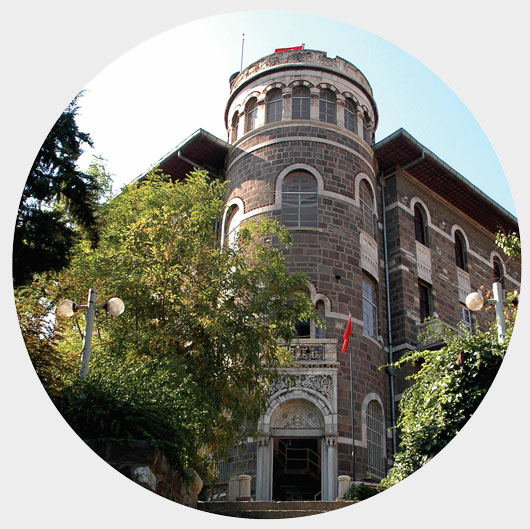 In 1950 it was taken over by the Ministry of Health and renamed as Izmir State Hospital. By the way, a section of Faculty of Medicine of Ege University operated in this building before it moved to its new location. The hospital building has been serving as Gynaecology and Obstetrics Hospital since 1985 and was renamed as Dr. Ekrem Hayri Üstündağ Gynaecology and Obstetrics Hospital in 2000. The building affectionately called Piçhane for having served as an orphanage for a period was erected in 1831 as the St. Rock Hospital for plague stricken. The neo-classical building bearing Byzantine style ornaments was reconstructed in 1845 and started serving as an orphanage. During the Greek occupation in Izmir, it hosted Greek orphans and its name ‘Pichane’ as Turks called dates back to this period. In the republican period, the building was used first as Public Health Institute and then as Provincial Directorate of Health. In 1984 it was handed over to the Ministry of Culture. 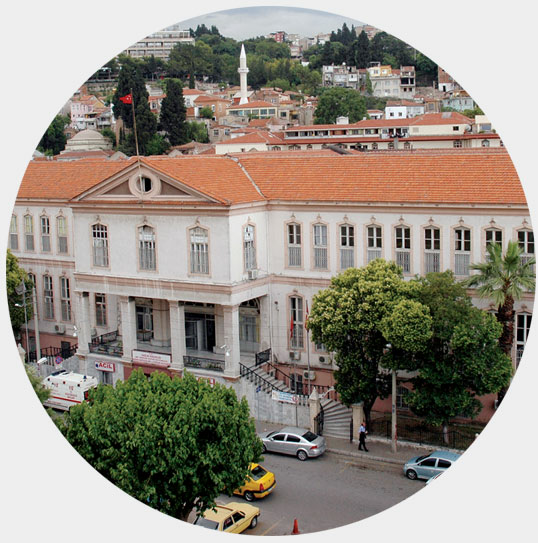 The building now functions as home to Izmir Ethnographic Museum and Provincial Directorate of Culture. The museum building located in Bahribaba Park was opened to visit in February 11th 1984. The three-storey Izmir Archaeological Museum consists of two exhibition floors, an open-air exhibition area, laboratories, a storage room where the objects are classified and protected, repair shops, a conference hall and administrative offices. The Hall of the Stone Works on the ground floor contains marble and stone works of sculptures, busts, portraits and masks. Among the most impressive statues displayed in this hall, the Androclos statute dating from roman period is thought to portrait Androclos, legendary founder of Ephesus. In the Ekrem Akurgal Hall of Ceramic Works on the upper floor, numerous archaeological items ranged from Prehistoric Ages to the Byzantine Period are displayed in chronological order. A bronze statue of an athlete and the bronze bust of Demeter discovered from the depths of the Aegean Sea are among the most noteworthy objects of the museum. In the Treasury Hall situated on the same floor with the Hall of Ceramic Works the electron, golden, silver, bronze and copper coins belonging to Archaic, Classical, Hellenistic, Roman, Byzantine and Islamic periods are exhibited. And in the garden, a rich selection of artefacts such as sarcophagi, steles, statues, long friezes, phalluses and inscriptions are exhibited. It is a “reverse L” planned two-storey building in a contiguous order. The stone-and-wood constructed building is covered with a double inclined roof and has a frieze of simple moulding. A twin window with horseshoe arches is situated over the entrance and the inscription of the building between. Izmir is unfortunately not very rich in mosques that well demonstrate Ottoman architectural styles. The fact that Izmir has no mosques erected in the name of Ottoman Sultans, on the other hand, explains why Izmir’s mosques are not as impressive in architectural style as the ones in other Ottoman cities. Constructed in 1671 by Yusuf Çavuşzade Ahmet Ağa, the mosque is one of the most important works in İzmir. It is located at the intersection point of 853 ve 856 streets which was on the shore of the inner harbour before the earthfilling of the sea. Its worshipping space is cubic and single domed with outstanding plaster decorations. The mosque underwent an extensive reconstruction in 1812. Its madrasah and library has long been ruined and public fountain out of water. The bird nest on its facade can be seen today. Located at the intersection point of 850 and 917 street, the mosque was built in 1906 by Salepçioğlu Hacı Ahmet Efendi. It has a large and three small domes with a slim and elegant minaret. Outer walls are coated with marble and green stones and its large dome is ornamented with gold foil. Its date of construction is unknown today, however an inscription on it states that it underwent a reconstruction in 1774-75. The mosque also housing shops on its lower floor is an octagonal planned single domed building. After climbing the stairs to the courtyard we enter the mosque between two symmetrical domes and the narthex covered with monastery vault. The interior decorations of the Mosque are definitely worth seeing. The mosque was last renovated in 1972. It is located at the corner of Anafartalar Street and 863 Street, and is surrounded by 869 and 873 Streets. It is located on Anafartalar Street, the heart of Kemeraltı. Its date of construction is unknown. Abacıoğlu Han is designed as a big courtyard in the middle and two storeyed shops around it. The caravanserai was renovated in 2007 and now serves touristic place with its restaurant, cafe, silver shops, carpet and leather shops and tea house. It is a very nice and comfortable spot for a break during your visit in Kemeraltı. Abacıoğlu Caravanserai has taken the back seat amid the crowd and rush of Kemeraltı, yet it stands out with its unique architecture and peaceful ambiance that strikes you as soon as you step in. Abacıoğlu Caravanserai, which is located on the right hand side of Anafartalar street which runs own from Kemeraltı Başdurak Mosque all the way to Arasta , between 919 and 920 streets is an asymmetrical planned structure that has a central courtyard and two storey shops around the courtyard. The building which is thought to have been built by Hacı Mustafa Ağa in the early 18th century, is made up of rough-hewn stone, clean cut stone and bricks. It is thought to be a 9 roomed and 7 vaulted structure originally, however only the northeast and southwest wings have survived to today. It houses 7 shops on the right hand side of the courtyard and 18 shops at the northeast wing on the right. Abacıoğlu Caravanserai restoration project of which was rewarded Philippe Rotthier European Architecture Award, today houses 18 shops including restaurants, cafés, souvenir shops and leather shops. It was built in 1667. The mosque has an Art Deco-like architecture style due to its large dome built on a square shape and four half domes. Its impressive mihrab (altar) is thought to be brought from Isa Bey Mosque in Selçuk. The mosque has an inscription above the entrance gate, and three domes in the narthex. 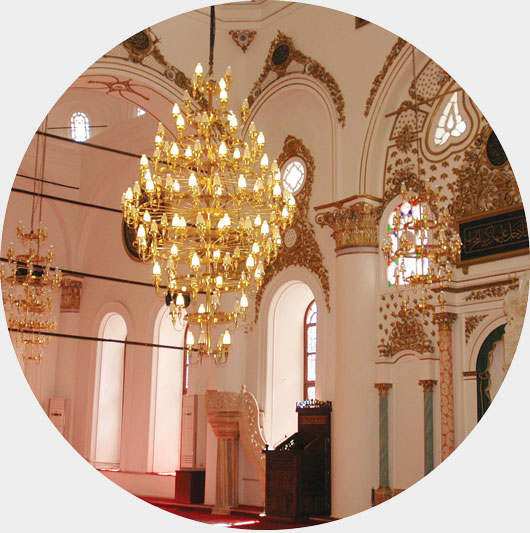 Kestane Pazarı Mosque is located in 872 and 882 Streets. The street was named after the synagogues located on the street. The Jewish people, who left Spain and immigrated to Izmir in 15th century, opened up shops in this street. In addition to their commercial successes, the Jewish people contributed Izmir a different culture with their traditions, customs and foods. The synagogues and mosques have been located side by side for years. The synagogues in Havra Street include Bikur Halim, Ez Hayim, Bet Illel, Talmut Tora, Sinyora Iveret, and Algazi which are the great examples of tolerance and brotherhood between the religions. Today, it is possible to find all kinds of foods in this street that functions as a permanent marketplace. The street is the first Jewish settlement in Izmir and is known as “Jewish Quarter” since 15th century. The Jews who were exiled from Spain and Portugal were welcomed by Ottoman Empire and settled down in Thessaloniki, İstanbul and Izmir. In 19th century the Jewish population in Izmir reached up to 55 thousand while the city’s total population was 150-200 thousand. In the early 20th century İzmir’s Jews were centred on Karataş districts. After 1948, most of them immigrated to Israel and the remaining Jews settled at Alsancak. Although mostly abandoned today, Izmir’s Jewish quarters were previously dynamic commercial centers with various merchants and craftsmen. This hammam was built in 17th century and is located in Havra Street. However, its healing water has long since cut and it was transformed into a commercial passage. The National Sovereignty House, which is also known as the former municipality building is located at Hisarönü quarter. The area where it stands now, housed the Latin Metropolis Church and Saint Pierre Castle of Genoese in late 13th century. The castle was demolished by the Ottomans and the ‘Archers’ Castle’ was built in the area. The Archers’ Castle that changed hands many times over the years and held by foreign authorities under Ottoman supervision due to the capitulations, was demolished in late 19th century and the Municipality Building was constructed along with several others. The building hosted Izmir Committee of National Defence during the years of National Independence struggle, served as the municipality building after the republic for many years. After the municipality offices moved to another location ın 1970’s it remained empty until 1991 when it was handed over to and taken under preservation by TBMM (the Grand National Assembly of Turkey) Department of National Palaces. After extensive renovation works that was completed in 1995, it was presented to Izmir’s historical texture as the TBMM National Sovereignty House. In 1997, considering the tourism potential of the area, it was turned into a culture and art center. Today, it contains a café and a shop where the cultural publications of the Department of National Palaces as well as Hereke carpets and replicas of historical Yıldız Porcelains that are faithfully manufactured in limited numbers are sold. And the second floor houses a permanent exhibition of Ataturk photographs and other halls that host various cultural events such as panel discussions, shows, exhibitions and concerts. It was built in 1636. It is located at the corner of Anafartalar Street and 912 Street. It is thought that the mosque was named after the şadırvans (water tank with fountain) under and near the mosque. Like Başdurak Mosque, Şadırvan Mosque houses many shops. The mosque was renovated in 1815. Arap Han is located next to Küçük Karaosmanoğlu Han on Anafartalar Street. Its date of construction is unknown because its inscription does not exist. However, the building is mentioned in the yearbooks of 1890-91 of Aydın Province, which suggests, along with the architectural character of the building, that it was constructed in the second half of 19th century. Arap Han once housed the print shop of the Jewish Esperans newspaper published in Ladino. It contained mainly shoemakers’ and shoe sellers’ shops shoemakers’ shops however it today houses drapery shops. The rectangular planned building is made up of rubble stone, clean cut stone and bricks. There is a small mosque within its courtyard. The main facade is two storeyed while the wings on both sides of the courtyard are single storeyed. Of the rooms on the second floor, only the ones over the entrance keep their original character. The rooms on the second floor are opened to the wooden ciling corridor through a door and a window. Kadı Hamamı was built in 16th century and is located in Anafartalar Street. The dome of the public bath can be reached through an octagonal arched pulley. You can enter the barrel-vaulted tepid room after the dome. The rectangular planned bathing room consists of lancet arched and cradle vaulted niches on two sides. The bath is in a great condition and has been functioning as a public bath since its construction. It was built by Yakup Bey in 1592. Its central dome is supported by eight pillars. It has three large domes on the sides, three small on the back, and seven small domes on the narthex. It has a minaret with a single serefe (balcony). The mosque’s column caps and interior decorations have been well protected until today. Its minaret was partly damaged by the 2001 earthquake short after which it was renovated and re-opened to worship. The caravanserai is located next to Mirkelamoğlu Caravanserai, between 913 and 914 streets and Fevzi Paşa Boulevard in Konak, İzmir. Due to wreck of its epitaph, construction date cannot be determined. There is no sufficient information in sources either. However, as it has a plan drawn in 1850, it is assumed to have been built during late 18th or early 19th century. Constructed of cut stone, rubble stone and bricks, this caravanserai features an almost rectangular layout. North part was demolished during construction of Fevzi Paşa Boulevard. It is two storeyed with a courtyard. It can be predicted observing the remnants that there were three shops to the east of the courtyard, three different rooms with cradle vaults on the south wing, four shops on the west wing and a shop on the southwest corner. Remnants on the north edge of its west wing also shows that there had been a gate here opening to the courtyard through a corridor. The Historical Çakaloğlu Caravanserai is located between 895 and 861 streets in İzmir Halimağa Market (Kasap Hızır Quarter). The dates 1805-1806 inscribed on the public fountains on the west and east sides of the north entrance show that the caravanserai was built on this date during the rule of Selim III. Located in Kemeraltı, right next to Kızlarağası Caravanserai, this caravanserai is an 18th century Ottoman building. Constructed of cut stone, rubble stone and bricks, the caravanserai features a rectangular layout. It consists of a corridor in the middle and 18 rooms, 9 on each side. It is a rectangular planned building lying north-south direction. Located in the midst of 871 and 906 streets, Halimağa Bazaar and Hisar Mosque in Kemeraltı, Kızlarağası Caravanserai was built by Hacı Beşir Ağa, Kızlar ağası between 1743 and 1745, according to its inscription. With its location right behind the Harbour Castle, it has been a very important building for İzmir. One of the outstanding examples of Ottoman architecture in Izmir, the rectangular planned two storeyed building is made up of rough-hewn stone, clean cut stone and bricks. The rooms on the lower and upper floors of the caravanserai opened out onto a barrel vault corridor. To the north of the building is the coppersmiths’ covered bazaar. The main façade of the building is to the west overlooking 861 street. It is thought that, originally there were three domed oriels on the overlapping cantilevers on this facade, two on the West and South ends and in the middle. But only the one in the middle has survived until today. There is a square planned two storeyed building at the corner of the courtyard which is considered to have been a small mosque. A staircase on the West side leads to the second floor. There are two additional gates at two corners of the courtyard and staircases to the upper floor next to them. After the extensive restoration completed in 1993, the building is in good condition now serving as a touristic bazaar where you can find various handcraft products, carpets, leather products and impressive souvenirs. Do not forget to have a break at the tea garden in the middle of the courtyard where you can enjoy the mystic atmosphere and relax. Located on 914 street in Kemeraltı, Mirmelamoğlu Caravanserai does not have an inscription existing today and that’s why its date of construction is unknown. But due to its architectural structure and connection with other buildings around, it is thought to have been built towards late 18th century. There are 21 rooms on the second floor. Three of these on the west are open to a cross vaulted iwan, and others to colonnades. Doors are built in Bursa cove style. Rooms opening to colonnades are all monastery vaulted. The caravanserai, being planned to be restored soon, is home for fur producers, a restaurant, a tea house, a music shop and antique stores. It is built as customs warehouses of İzmir which became an important port city in early 19th century. It is thought that the architect of the building is French Gustave Eiffel or someone of his school. The façade of the building facing First Kordon is naturally the most spectacular part. Two big gates were built on two sides of the building in order for import goods to enter the city under control. The customs building, owned by a French company, was handed over to İzmir Port and Gulf management in 1925. In 1934, the company was bought by Turkish state. Used by many institutions for different purposes along years, the building was worn-out and wrecked in 1990's. First saving move, measured drawing, was done in 1995. It took 9 months to remove the rust from steel construction of 365000 tons. Once its stability is ensured, the construction was painted and lanterns on the roof and windows were restored faithfully. It was put into service as a shopping centre in 2004. Thus arose one of the symbolic buildings of İzmir: French customs or Konak Pier with its new name. Once living in Kardiça which is an agricultural town in inner Greece, İbrahim Bey, grandson of Halil Onbaşı, migrated to İzmir with his sister and some family members in 1910, in the wake of the worry that they would not be able to make a living in Kardiça. He bought a building close to Pasaport Pier as his first investment. One of the first tobacco dealers in İzmir, İbrahim Bey transformed the building, once a hotel, into a tobacco house in a short time. İbrahim Bey also used to trade figs and grapes. As the building came short after some time, İbrahim Bey started building Grand Kardıçalı Caravanserai on the corner where today's Second Kordon and Mimar Kemalettin Streets cross.The building is one of the first concrete buildings in Turkey. Lumber was brought from Italy, iron from Germany and cement from Romania for the construction. The caravanserai was completed and put into service in 1928. The architect of the building is Mehmet Fesçi Bey, one of the famous architects of Republic era. The building is recorded as Kardıçalı İbrahim Bey Apartments in official papers of the time. Resting on an area of 2000 square metres, the caravanserai is one of the most important buildings constructed in the First National Architectural School style. The building has two fake metal domes on the corner facing Mimar Kemalettin and Second Kordon streets. Sharp arched windows are used on the second floor. There are tile panels under the domes on the corner. Reliefs with plant motifs are placed on the plasters dividing windows, on top of the sharp arched windows on the second floor, under the domes and on the balconies. On the other hand, windows on each floor are different. Corridor roofs of the caravanserai with more than a hundred rooms are high. Corridors are lightened through a space in the middle of the caravanserai from the roof to the ground. This space is covered with glass. There are two staircases up to the floors. There had been once an operating elevator in the staircase space on the east but today it is out of use being kept on the second floor. After İbrahim Kardıçalı's death in 1952, his inheritors sold and rented out most of the shops. There are 20 inheritors of the caravanserai today. The building is worn out and neglected. A restoration has been held in 2003. Today Grand Kardıçalı Caravanserai is transformed into an art complex, which is a new page made possible by private art centres. The caravanserai today houses studios and workshops of opera, ballet, music, art, sculpture, wired instrument repair and puppetry also serving as fine art courses for youngsters.